Sorry folks: I haven't blogged much during the past 4 months. I've been busy putting my life in order & focusing on my non-blogging career. Back in August, I was downsized from my job as a baker (I know! Sadness!) At the time I took it as a personal blow, but I managed to turn it into fodder for a comedy show at a local comedy club! Look at that face! It has comedy written all over it! Unfortunately, I did suffer a physical blow. I was tailgating (codeword for "drinking") with my friends at a Carolina Panthers game and...to make a long story short--I broke my left wrist. No cooking, no writing, no typing & certainly not much eating. Tomorrow I get my cast off after nearly 8 weeks of constant pain, suffering, and carrying my arm around in a sling. 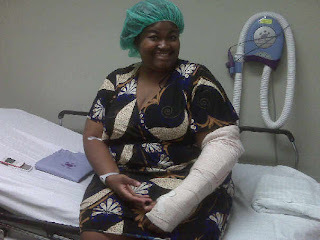 Me at the hospital right before my surgery. Yes, the break was pretty bad. There was anesthesia and a overnight stay involved. To celebrate my new & improved wrist, I made a snack for you! 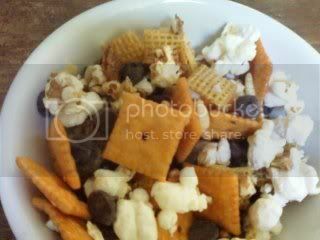 A mere one cup of this snack mix is 140 calories and 2 grams of fat. I mixed up a batch of this and have been snacking on it non-stop for the past month. It's sweet, salty, crunchy & oh-so satisfying. It's great to munch on while you're doing your holiday baking, before you step out to that holiday party serving the "light hors d'oeuvres" or to tide you over 'til dinner. 'Tis the season to eat, drink & be merry. I plan on doing all 3 in excess over the next 3 weeks. The only things I won't be indulging in is the weight gain, bloat & heartburn associated with gluttonous activities. 1. Mix cereals, 1 cup of the cheese crackers and 2 cups of the popcorn in large, microwavable bowl. Set aside. 2. Place Smart Balance, brown sugar, corn syrup and salt in 2-cup microwavable measuring cup. Microwave on High 1 minute 30 seconds. Stir; microwave on High until bubbling. Remove from microwave; stir in baking soda. Mixture will foam up, but keep mixing until baking soda is dissolved. Pour over the cereal mixture; stir until fully coated. 3. Microwave on High 4 to 5 minutes, stirring after every minute. Spread on waxed paper-lined baking sheet. Let cool for about 5 minutes to let caramel fully harden. Stir in remaining 1 cup cheese crackers and 1 cup popcorn. 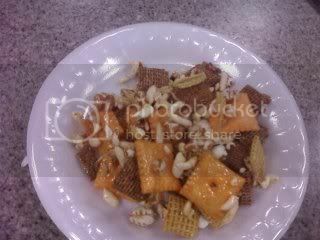 I called it "snack mix" just because I don't always use Chex. Feel free to mix and match your favorite cereals, using the same ratio (I used Cheerios in place of the Kashi) and add nuts, chocolate chips, or pretzels for additional flavor and crunch. Another time, I used Orville Redenbacher's 97% fat free microwave popcorn instead of breaking out the air corn popper. I added a cup of dark chocolate chips after the mixture cooled and that brought a whole new dimension to the mix. Adding the dark chocolate only adds 1/2 gram of fat per serving, so it's still a low-fat snack option. I'm really glad you are on the mend Nik and just in time for the holidays!!!!! Its good to hear from you! Sorry to hear about your break but glad its on the mend.